Sankt Pölten ( [zaŋkt ˈpœltn̩]), mostly abbreviated to the official name St. Pölten, is the capital and largest city of the State of Lower Austria in northeast Austria. 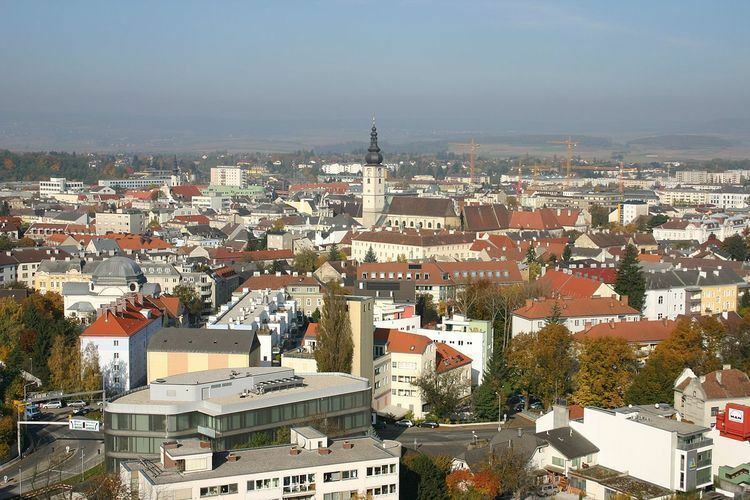 With 52,716 inhabitants as of 1 January 2015, it is Lower Austria's largest city. St Pölten is a city with its own statute (or Statutarstadt) and therefore it is both a municipality and a district in the Mostviertel. The city lies on the Traisen river and is located north of the Alps and south of the Wachau. It is part of the Mostviertel, the southwest region of Lower Austria. The city's main railway station, St. Pölten Hauptbahnhof, is located directly on the West railway of the ÖBB and is also the terminus of the Leobersdorfer Railway, the Mariazellerbahn, the regional railway to Tulln and the regional railway to Krems. It is at the intersection of the Western Motorway A1 and the Kremser Speedway S33, and is traversed by the Vienna Road B1. St Pölten is a junction of the Wieselbus bus lines, which provides radial connections between the capital and the different regions of Lower Austria. Between 1911 and 1976, a tramline operated in St Pölten. Today, a network of eleven bus lines operates at regular intervals within the city. Every summer, a free tourist train in the city centre connects the ancient parts of the city with the government district. St Pölten is divided into the following subdistricts: Altmannsdorf, Dörfl at Ochsenburg, Eggendorf, Ganzendorf, Hafing, Harland, Hart, Kreisberg, Matzersdorf, Mühlgang, Nadelbach, Oberradlberg, Oberwagram, Oberzwischenbrunn, Ochsenburg, Pengersdorf, Pottenbrunn, Pummersdorf, Ragelsdorf, Ratzersdorf at the Traisen, Reitzersdorf, Schwadorf, Spratzern, St Georgen on the Steinfelde, St Pölten, Stattersdorf, Steinfeld, Teufelhof, Unterradlberg, Unterwagram, Unterzwischenbrunn, Viehofen, Völtendorf, Waitzendorf, Wasserburg, Weitern, Wetzersdorf, Windpassing, Witzendorf, Wolfenberg, Wörth and Zwerndorf. The oldest part of the city is built on the site of the ancient Roman city of Aelium Cetium that existed between the 2nd and the 4th century. In the year 799, it was called Treisma. 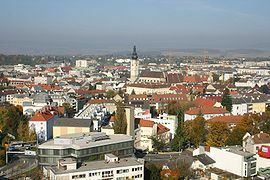 St Pölten did not become a town until 1050 and officially became a city in 1159. Until 1494 St Pölten was part of the diocese of Passau, and then became the property of the state. A Benedictine monastery was founded in 771. In 1081 it hosted the Augustinian Chorherren and in 1784 their Kollegiatsstift closed. Since 1785, this building has hosted the cathedral of St Pölten. The city replaced Vienna as the capital of Lower Austria with a resolution by the Lower Austrian parliament on 10 July 1986. 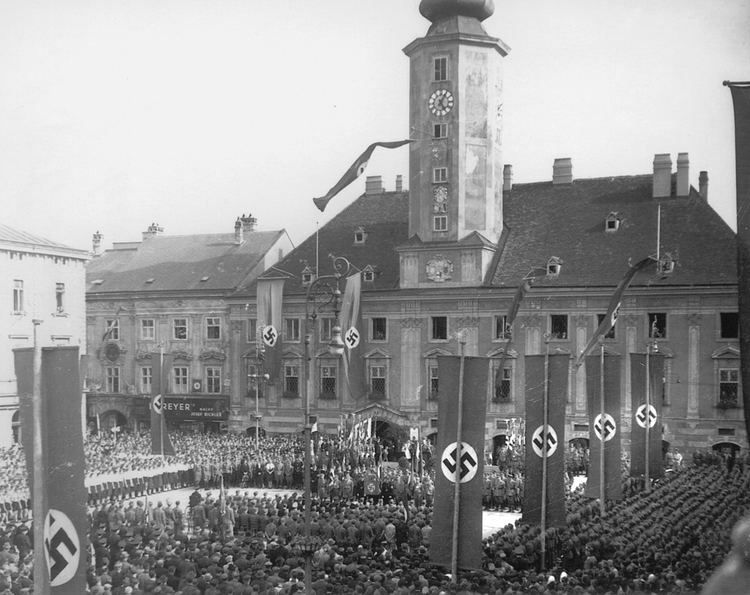 The Lower Austrian government has been hosted in St Pölten since 1997. The name St Pölten is derived from Hippolytus of Rome. The city was renamed to Sankt Hippolyt, then St Polyt and finally St Pölten. On 9 July 2004 the municipal council elected the former senator for culture Mag. Matthias Stadler (SPÖ) as the new mayor of St Pölten. The first vice mayor is Susanne Kysela (SPÖ); the second vice mayor is Johannes Sassmann (ÖVP). The arms' blazon is silver and azure; on the right a fess gules, on the left a wolf rampant silver langued gules and armed Or. The colours of the city are red and yellow. The seal of the city contains its coat of arms surrounded by the text Landeshauptstadt St. Pölten. The administration's seal of the magistrate also contains the city's coat of arms with the text Magistrat der Stadt St. Pölten. As of 15 May 2001, 40,041 people worked in 2,711 companies in the city. 23 of those companies are large-scale enterprises with more than 200 employees each. Several media companies are based in St Pölten. These are "@cetera", a literary-cultural magazine; "City-Flyer", an online magazine describing the cultural offerings of the city, which is published on paper monthly; "Campus Radio", a radio station from the University of Applied Sciences; "HiT FM", a radio station broadcasting in Lower Austria; "LetHereBeRock", an online youth magazine about the alternative rock scene; NÖN, a Lower Austrian newspaper; the Austrian Broadcasting Corporation for Lower Austria; and the local television channel "P3tv". 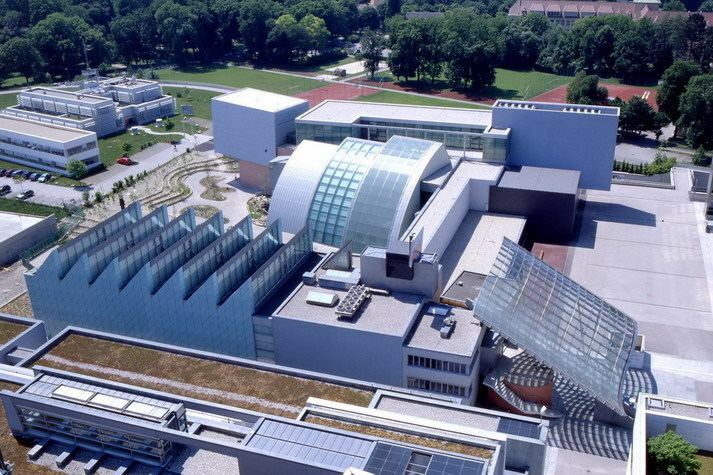 The largest companies based in St Pölten are the furniture producer Leiner, the paper manufacturer Salzer, and the family owned engineering conglomerate Voith. St Pölten hosts a primary base of the Lower Austrian state sports school. 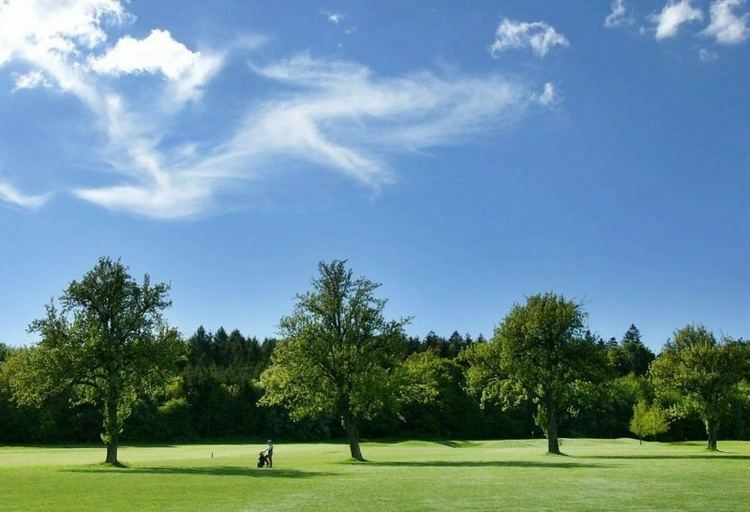 Every year in the third week of May the ATP tournament takes place in St Pölten. There are multiple local tennis stadiums, including the Arena im Aufeld, the tennis centre Allround, the tennis courts by the local ice sport association 1872, the courts in St. Georgen, the courts at the Ratzersdorfer Pond, the courts in the Lower Austrian state sports school and the courts of the leisure park Megafun. St Pölten festival weeks "Klangweile"